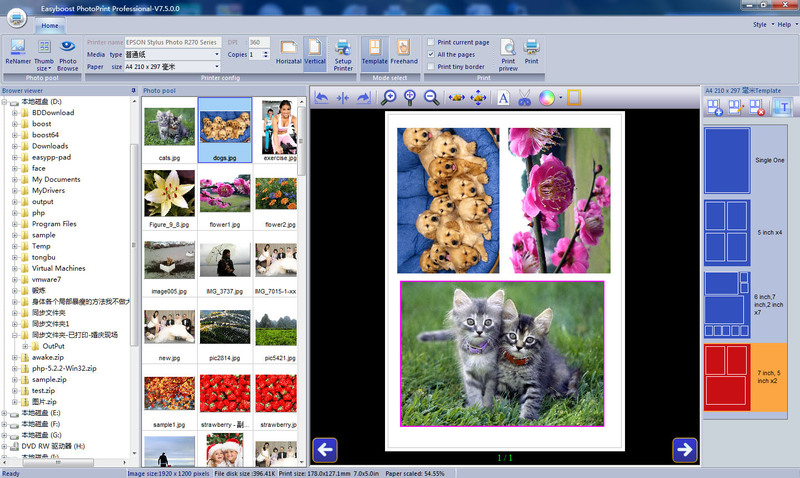 Easyboost photo Print is a powerful and easy-to-use application for photo print and gives user option to make batch of photos for preview page by providing lot of print templates. Easyboost Photo Print is a powerful and easy-to-use application for photo printing, giving users the option to preview their photos through the application of templates. Each template is customizable, with users able to vary the size of their photos and prints according to their needs, and best of all these preview pages are an exact representation of the final printed creation. Advanced color adjustment controls allow for the correction of any exposure mistakes as well as the application of techniques to bring true creativity to your images. In addition the software smart feature automatically calculates the best size, zoom and color enhancement etc to produce the best quality picture. With a simple, easy to use layout Easyboost Photo Print software is suitable for all levels, from beginners to professionals. Presto Transfer AIM helps transfer your AIM IM archives (conversations) and settings from one computer to another.